Canon Lawyer Ed Peters on Baptism: You might recall when I [Ed Peters] blogged against using baptismal formulae contrived to avoid masculine nouns for Father, Son, and Holy Spirit. I said back in 2004 that such ‘baptisms’ were invalid, and that people who received ‘baptism’ under them were not even Christian, let alone Catholic. Looks like CDF agrees. • Will the pastors responsible for these invalid baptisms take immediate corrective action? • Will bishops– who are responsible for the proper administration of the sacraments in their dioceses– make sure that the invalid formula is dropped? Baptism is no light matter. If pastors don't respond vigorously to this alert from Rome, it can only mean that they have lost interest in the sacramental life of the Church. For Phil's complete news story on this, click here. Was the Anti-Catholic Correct on YouTube? Was St. Ignatius a Protestant? An anti-Catholic recently put up a pathetic YouTube video criticizing my recent radio show where I talked about the Apostolic Fathers and how Catholic they really were. Some of these angry anti-Catholics try to twist the early Christians into pretzels — ridiculously trying recreate them into Reformed Baptists or other such nonsense. I recently wrote a blog quote quoting professor and a self-confessed “proud, dispensational, conservative, born-again fundie” from Moody Bible Institute that wrote a book entitled "Getting to Know the Church Fathers" who said the early Church Fathers "were not Evangelicals." If you are interested in such debates you will find these two YouTube presentations below very interesting. I consider such anti-Catholic sophists as a huge waste of time, but I appreciate the fine work of William Albrecht as the Catholic Legate. He has actually posted many such YouTube videos that are very worthwhile watching. I will post links to others when I get home and get the time. "I just wanted to bring to your attention James White’s analysis of your use of Ignatius of Antioch. White’s analysis may very well be the worst form of sophism I have ever heard. In fact, I began feeling really sorry for him. I was embarrassed for him. You should be proud of your work and the fact that your strongest critics wind up making your case even better! Keep up the good work!" To watch another video concerning St. Jerome click here. I've always felt sorry for this man myself and often said that he makes people who get too close feel like they need a shower. More later. I am in Israel now, leaving for Jordan tomorrow. Will follow up on this all more when I get home. One can't walk the streets of the Old City of Jerusalem — like I'm doing this week — and not wonder what in the world God has done and is doing with the Jews. Did he abandon them after they as a nation rejected his Messiah? Do his promises to Abraham still stand for the ethnic children of Abraham as well as for the spiritual children of Abraham through faith? 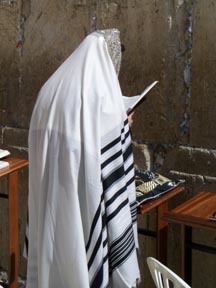 I wrote on this a while back entitled Jews & the Existence of God, and now Mark Brumley of Ignatius Press has written an insightful article on the matter too — entitled The Pope, the Prayers and the Jews. Having been here in Jerusalem so often I have grown to have an even greater respect for Abraham and his children through Isaac the son of promise. It is fertile ground for contemplation and meditation. By the way, Mark Brumley and Roy Schoeman (Jewish convert) will be speakers at our upcoming Holy Land Pilgrimage in November 2008. Join us for a thrilling trip that will emphasize the Jewish background and importance to the Catholic faith. We will have many talks and discussions about Israel, the Jews, the Messiah and the Catholic Church. Loaves & Fishes: the Miracle that Never Happened? Here We Are – Stuck in 40 Days of Lent! Steve will join Chuck Neff to promote Relevant Radio during the fund drive. The interview will be between 1:30-2:00 Eastern time. To learn more or to contribute, click here at www.relevantradio.com. Holy Land Pilgrimage with Steve Ray, Teresa Tomeo & Immaculee Ilibagiza! !